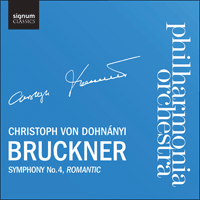 Continuing Signum’s series of live orchestral releases with the Philharmonia Orchestra, on this new disc Christoph von Dohnányi leads a performance of Bruckner’s Symphony No 4, the 'Romantic'. Bruckner stands out from other 19th-century symphonists; his large-scale works demonstrate a unique fusion of conservative and radical elements, notably influenced by composers such as Wagner and Beethoven. He appended not only the title 'Romantic' but even included a programme for the Fourth Symphony, sometime after composition. Though he later withdrew it, the scenario is a mediaeval Romantic ideal, where knights awaken to the sound of horns, rejoice and repair to prayer, before the inevitable hunt and ensuing festivities. For a composer whose symphonic output is adored by audiences the world over, and is secure in the repertory of every major orchestra, it is curious to learn that during his lifetime Bruckner was considered to have been something of a fool by a good many of his contemporaries. Sketches and anecdotes by his pupils, peers, friends and confidantes abound in descriptions of everything from his eccentric manner of dress and rustic accent to his idiosyncratic personal habits. These reminiscences range from the rather cruel, through the bewildered, to those of awed admiration. Brahms thought him a ‘poor, deluded person’ who wrote ‘symphonic boa constrictors’, which, no doubt to Brahms’s mind, squeezed the life out of their audiences. The vitriolic and influential pro-Brahms, anti-Wagner critic, Eduard Hanslick was similarly visceral in his condemnation of Bruckner and his work, describing his Third Symphony as ‘A vision of Beethoven’s Ninth becoming friendly with Wagner’s Valkyries, and finishing up trampled under their hooves’. The conductor Felix Weingartner recalled being soured to Bruckner at Wagner’s grave, shortly after the great composer’s death, due to Bruckner relating the success of his latest symphony, in loud, seemingly disrespectful tones. [Bruckner] had an untainted happiness, which at times was youthful, almost childlike, as well as an inherently trusting nature. Thus, despite the large gap between us, we had a friendly relationship … And so I may, with more right than most, call myself his ‘pupil’, and I will always do this in grateful admiration. Perhaps Bruckner’s social awkwardness and apparent worldly naivety was simply easier to anecdotalise than the more mundane facts of a hardworking, deeply religious and relatively unsophisticated individual, at odds with the cosmopolitan mores of the ultra-modern-thinking of the Vienna of the late 19th century. His many unsuccessful proposals of marriage and failure to even get close to tying the knot only strengthen the image of the childlike soul. He appears to have suffered from the obsessive-compulsive disorder associated with order and symmetry, numeromania—a compulsion for counting anything and everything. At one point this and other factors led to him being consigned to a sanitorium for three months in the summer of 1867. Reports that Bruckner had little interest in the art, philosophy and literature of the day would have seen him cut a fairly strange figure in Viennese intellectual circles of the day. On the other hand, he was more than able to hold down two important appointments in the city, as an organist to the court chapel and as Professor of Harmony and Counterpoint at the Conservatory, hardly positions to be occupied by a dolt. He was also one of the great organ virtuosos of his time, most notably as a peerless improviser—evidenced not only in Vienna, but also in trips to Nancy and Paris in 1869 and London in 1871, where he performed in numerous concerts at the Albert Hall and to a reported 70,000 during an organ festival at Crystal Palace. The son of a school teacher and parish organist from the village of Ansfelden, in Upper Austria, the young Anton Bruckner was taught piano and organ, before being sent to St Florian monastery on his father’s death in 1837, when he was twelve years old. By 1845, he was already teaching at St Florian, where he held various posts for the next decade or so. A steady progress took him to Linz, as cathedral organist and more studies with the renowned Simon Sechter, a Professor at the Vienna Conservatory, whose postal course in harmony and counterpoint he completed in five years. Bruckner continued to have minor successes with his sacred works, but it was his discovery of the music of Liszt, and more especially Wagner, which changed the course of his life as a composer. Thus, in his early 40s, in 1866, he was set on his path as a symphonic composer, encouraged by many, including Berlioz, Liszt, the eminent conductor Hans von Bülow and even Eduard Hanslick, who initially thought he had unearthed a great Austrian symphonist, that is, one that would follow the conservative line. In the 1870s, Hanslick and his coterie would turn rabidly against Bruckner as Wagner’s influence became more manifest in his music. They considered the music of Wagner, Liszt and their followers, Bruckner now included, as a decadent aberration in music’s development, lauding Brahms, their standard bearer (whether he liked it or not), as the prime musical conservative. [Wagner] just looked at me with such a kind gaze that I can still feel it today. Then he embraced me and kissed me again and again. Afterwards he pointed to a pile of music and said, ‘Look—nothing but dedications. But your work is a masterpiece; I am pleased and honoured that it’s intended for me. The first performance of the Third Symphony, despite, or possibly in part because of the dedication, was a disaster, with the audience departing en masse during the final movement followed by a brutally scathing review from Hanslick. The Brahms versus Wagner debate was now at full tilt in Vienna with neither camp taking any prisoners. Fortunately, for the first performance of the Fourth Symphony, one of the great conductors of the age, Hans Richter, calmed the waters. A mighty musical figure, his broad intellectual outlook extended to both Brahms and Wagner, and his stature such that he was admired by both sides of the musical argument. This made him one of the few conductors who could withstand Hanslick’s entrenched views. A number of Bruckner’s adherents were leading lights of the Wiener Akademische Wagner-Verein (Academic Wagner Society of Vienna) not long after its foundation in 1872. The society was founded to further the music of Wagner, but also of those composers who surfaced in his wake. Josef Schalk, his brother Franz, and Ferdinand Löwe were the evangelists for Bruckner, not only spreading the musical good news, and arranging two- and four-handed piano run-throughs of the symphonies under the auspices of the society, but also getting rather too involved in the workings of the creator. Their many revisions, while well-intentioned and effected to make the composer’s symphonies more palatable to the public, disrupted Bruckner’s pace and orchestration in even the least invasive of their interventions. Bruckner himself was a willing collaborator in these exercises and happy to sanction many such ‘normalisings’—a situation which has kept musicologists busy dealing with the so-called ‘Bruckner Problem’. Bruckner appended not only the title ‘Romantic’ but even included a programme for the Fourth Symphony, sometime after composition. The scenario is a mediaeval Romantic ideal, where knights awaken to the sound of horns, rejoice and repair to prayer, before the inevitable hunt and ensuing festivities. Though later withdrawn, there are certainly elements of the programme which add a great deal of fun, when listening to the work as well as supplying clues to the composer’s initial inspiration. The first movement opens indeed with romantically rousing horns over bucolic murmurs in the strings before woodwinds coax the full orchestra to a glorious awakening. Dance themes lead the movement further, Bruckner taking his lead from Schubert and foreshadowing Mahler. The second movement opens with the cellos speaking of what Bruckner called a ‘rustic love scene’, while the horns offer mystery and the violas mix lines of beauty with tragedy. The Scherzo doesn’t take long to get under way as the horns exuberantly bring the hunting party together in a movement which is packed with vigour and verve, lightened by the Ländler Trio section. The Finale opens ominously, the horns again in evidence over an insistent pulse. Despite its pastoral interludes, the movement is a monumental struggle; even its most resplendent climaxes are troubled, before Bruckner’s extraordinary coda, organ-like in its grandeur, brings the work to a transcendent and breath-taking end. Bruckner began sketching the symphony in 1874 and continued revising it for around 15 years until its eventual publication in 1889. Many editions of the work have appeared since Bruckner’s death, based on the numerous versions. The history of the symphony’s composition, revisions and editions is lengthy and complex, but for the purposes of the present recording, the version performed is that of 1878/80 in the edition by Robert Haas of 1936. This is the version that Richter premiered in Vienna, with the city’s Philharmonic Orchestra on 20 February 1881. The Academic Wagner Society funded the concert and its members were certainly out in force to support their man, but the symphony was nonetheless a success with the general public and also a rare critical triumph for Bruckner. Even the mighty Hanslick and his colleagues at the Neue Freie Presse accorded it an ‘unusual success’ while the partisan Vienna Evening Post was of the opinion that Bruckner must now be counted as one of Austria’s greatest composers. Revisions, decisions and editions aside, a fact we know only too well today.